Recently in class I asked my students to write down the process they use when writing essays. I told them to be as honest as possible and to not be afraid of disappointing me. Pages filled with “I freewrite about the essay topic for 5 minutes and then write an outline” would be gratifying, sure, but unless I know what my students are really doing when they write their essays, I won’t know how to help them. The answers I received were frightening. Answers like the ones above scare me because jumping straight into the research phase of an essay before thinking about what your own knowledge of and opinions about the topic are is a sure-fire way of setting yourself up to accidentally plagiarize. 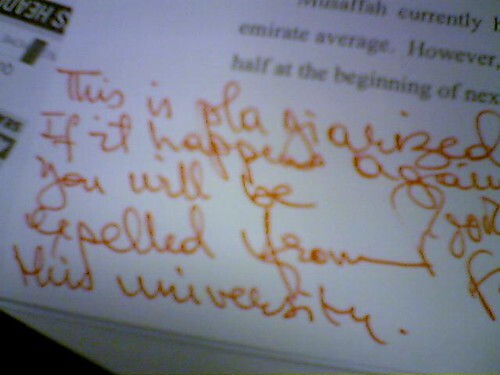 Every institution of higher learning will have plagiarism defined explicitly in the student handbook. If you’re currently enrolled in classes and haven’t yet read through what constitutes academic dishonesty in the student handbook, read the policy NOW. “I didn’t know” is not a valid excuse if you accidentally plagiarize because all students are expected to have read and agreed to the policies laid out in the student handbook before attending classes. If you’re not currently enrolled in school, an informal definition of plagiarism is “the representation of someone else’s words or ideas as your own.” It doesn’t matter whether you committed plagiarism intentionally or unintentionally either. Plagiarism is plagiarism. The easiest way to avoid plagiarizing is to write down everything you know about the essay topic BEFORE you research it. That way, you’ll know to cite any and all new information that you acquire as a result of your online or offline research. You should also write down your ideas, opinions, and arguments for or against the topic before you research so you know which thoughts originated with you. Once you start reading other people’s interpretations of the topic, it’s next to impossible NOT to think about their points and arguments when trying to develop your own argument in an essay. I’ve been there too and I know how difficult it is to figure out whether or not you would have thought up the compelling argument you just read had you not just read it. If you absolutely have to look at a sample essay because you want to model your own paper after one that is well written, look for a well written essay that is NOT about the topic you were assigned to write about. That way, you have an example to follow for how to set up the different sections of an essay appropriately, and you’re not muddying your ideas with someone else’s. The next few posts will deal primarily with plagiarism and how to cite material properly so you will never be accused of having plagiarized. If you’re not yet familiar with the difference between summarizing, paraphrasing, and quoting, look those terms up! I’ll be writing about each later, but don’t wait for me to get to them before you know the differences. If you are at all doubtful of whether or not you have plagiarized, intentionally or unintentionally, run a search for “what is plagiarism” in the search engine of your choice. Remember, ignorance is not an excuse.